Bic really turned the corner last year in the pen design department with the release of the 537R and 730R. Both were very nice liquid ink needle tip pens that performed very well and looked great to boot. The Bic 730RT 0.7mm gel kept some of the same design elements as its predecessors, but it doesn't quite cut it in the performance department. I was able to test out this pen at the Staples writing station recently, and I knew pretty quickly that is wasn't up to par with comparable pens like the Pilot G-2 and Uni-Ball Signo 207. I purchased it anyway so I could try it out more at home, but it continued to unimpress there as well. The line is not as clean or as sharp as some of its peers, and it is not as smooth of a writer as well. While the barrel looks nice, it feels cheap - sort of like Bic's products from years past. It is lightweight and constructed poorly, with plastic seams visible and an overall cheap feel. 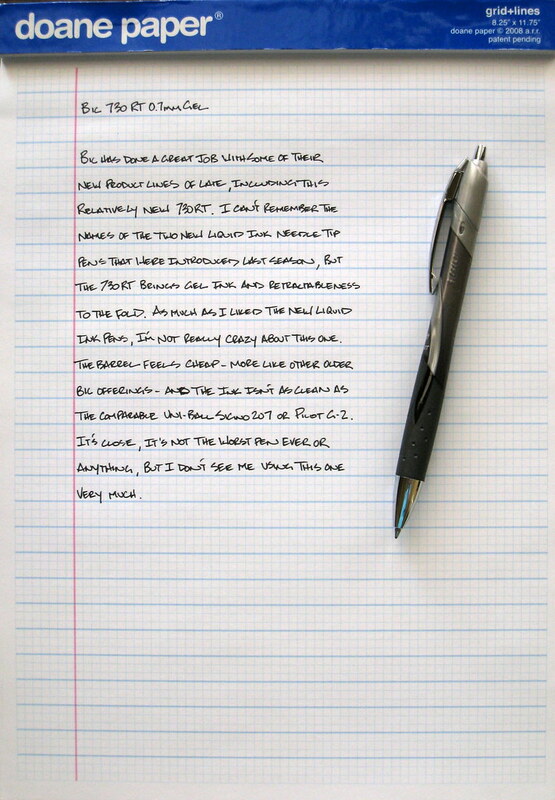 The 730RT is nowhere near the pen that the 730R and 537R are. Posted on May 14, 2010 by Brad Dowdy.